How do you feel when someone tries to “sell” you something? They try to convince you that you need their product, and they insist that theirs is better than anyone else’s. And they don’t even know you! In the industrial mass communications age, mass sales and marketing was accepted, even though tactics were often aggressive and arrogant. In the digital social age, though, people increasingly expect to be treated as individuals. People who try to “sell” something show that they don’t trust the people they’re talking to. If they trusted their customers, they would inform them but respect them to make the right decision. Digital social empowers customers to self-educate, so firms have a golden opportunity to take the leap, to stop “selling” and start trusting their customers—and boost profit. Here’s how it’s done. We think our customers are dumb. We have to think for them and show them why they need us. We don’t trust them to make the right decision. Pervasive real-time networks increasingly connect products/services with customers, so the way in which we inform has to transform. It is likely that your customer’s friends or connections will introduce your product to him or her. But not if you’re trying to “sell” yourself to people. The next step is developing a concrete vision for what it would look like to change your firm’s attitude and brand’s point of view. Since I am writing about a general, widespread shift, I am confident that it applies to most firms and brands, but I cannot assume how it applies to you. Therefore, you need to do that work. Get a group of colleagues (friends/connections) together around a whiteboard. Take an unvarnished look at your current state. Develop an alternative future that’s hard-wired to trusting your customers and prospects. Brainstorm what that would look like to inform without selling. Inform prospects from a foundation of respect, and focus on their outcomes, not the use of your product. You can’t fake this. You may well encounter resistance from certain people or groups in your firm. Then start using the new messages in ways in which you can compare them to your current approach, using A/B testing or similar protocol. Test your email marketing, web pages, tweets, social network updates, blog posts, etc. Do not survey customers openly because it will introduce all kinds of bias. Depending on your products/services, customers’ communications preferences and cultures, you could get results in days or months. Organize several small tests and iterate. Once you have some results to share, identify your executives, marketers and salespeople with whom these concepts resonate. Encourage your salespeople to blog about customer and prospect situations and their insights about those situations. Without mentioning your product or service. As shown in Go to Where Your Customer Is, your colleagues will get much better results when they talk about customer outcomes, not your products. Customers buy the outcomes of using products (“jobs to be done”); they usually regard products as a means to an end. And the end is personal, individual. If you’re a B2B or B4B firm, consider changing your face to face approach to interacting with prospects and customers. As the principal of my own professional services firm, I try to learn as much about my prospects as I can, but I openly share with them what I know and emphasize my ignorance of their situations. This opens the door for them to share more with me, and we embark on discovery together. I openly say that my main goal is to learn whether we are a good match because I don’t know. CSRA’s “pre-engagement” process has a very high connection rate, but we aim to reject prospects as quickly as possible. Since we don’t try to “sell” a prospect on our services, we can work together with them to discover whether we can help. We both win by discovering the fit as efficiently as possible. Since we have the same agenda, our process is transparent and efficient since the half-truths and ploys used by most salespeople and prospects are unnecessary. More approachable prospects because you’re not pushing them away by selling. A faster sales cycle because it’s not clogged with half-truths, ploys and delays; the lack of fudging also means better forecasts. More referrals because salespeople develop trust with every prospect, including those who weren’t a good fit right now. Relatively larger sales due to increased trust between prospect and provider. Happier salespeople and lower staff turnover because they lose the “us and them” mentality, which creates extensive stress and unhappiness. Lower customer churn because you haven’t “sold” people who really didn’t know whether they wanted to be your customers. Business founded in trust is far stickier and more profitable. As impressive as these things may be, they’re only the appetizers. 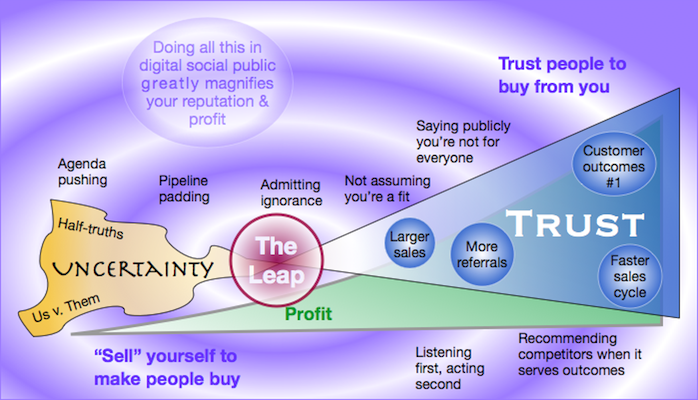 The main course is interacting in digital social public with prospects and customers using this ethos and approach. This enables you to develop and scale business intimacy with your most profitable customers and prospects who have similar outcomes. When prospects and customers see your teams being sincerely interested in people, responding to their questions, and giving them assistance without pitching, the whole crowd starts noticing. They start trusting you. You develop advocates who admire the fact that you care about people’s outcomes more than selling. After a while, they start wanting to buy from you because they trust you. Brands must go first in trusting customers. Many brands face very skeptical customers and prospects due to generations of “selling.” Don’t talk about being trustworthy, show how you care about people and are valuable to people by interacting in digital public. There is no compromising the leap: you either put customers’ outcomes first, or you keep customers second to your agenda. Customers know the difference. They will accept brands that keep themselves first as long as those brands deliver on expectations; customers have low expectations for businesses in general due to generations of brands’ putting customers second. Customers who come second don’t want to buy from you, even though they do buy from you. Look at Walmart’s collapsing profit, with no end in sight. That’s what happens to firms that put customers second. Customers reserve their love, advocacy and spend for brands that trust them and put them first. Such brands are rare in 2014, but since digital social is rapidly increasing transparency of all interactions, smart brands are discovering the secret, and those that take the leap will reset the bar for all. See IBM’s global study, Why Trust Matters. Listening and responding are the most powerful ways to show people that you care about them, and doing it in digital social public is very powerful. Admit to prospects you don’t know them or whether they should buy from you. Content marketing is an incremental improvement, but it will prove to be short-lived because it will cease to have impact when everyone’s doing it. Trust is far deeper. Lose the screen/bandwidth hogging mobile ads, the pop screens on blogs, the “hello Googler” and the like because they put your agenda ahead of the reader’s. The underlying assumption is that you want everyone to subscribe or click. That’s undoubtedly not true because most firms have very few profitable customers. Many brands are standing on the edge of low profit, commoditized products and frightening forecasts, but there’s a way out. Are you ready to take the leap?